So, with all the exciting events occurring in the world at the moment, let's focus on one of them. 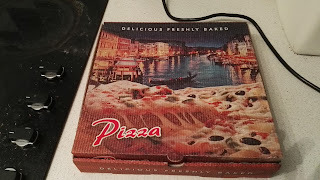 Yes, apparently today is Pizza With The Works Except Anchovies Day (really) - I'm a big fan of pizza, it's a wonderful invention, a sort of hot open sandwich . In a way, it's just a sort of cheese on toast (open grilled cheese sandwich for Americans) with extras, isn't it? Yet it tastes totally different to cheese on toast - and I do love cheese on toast also, in fact it's a source of disappointment to me that the grill in our oven doesn't work at the moment, so the only way of doing cheese on toast is to toast the bread, arrange the cheese upon the toast, and then microwave it, which just seems a bit wrong. 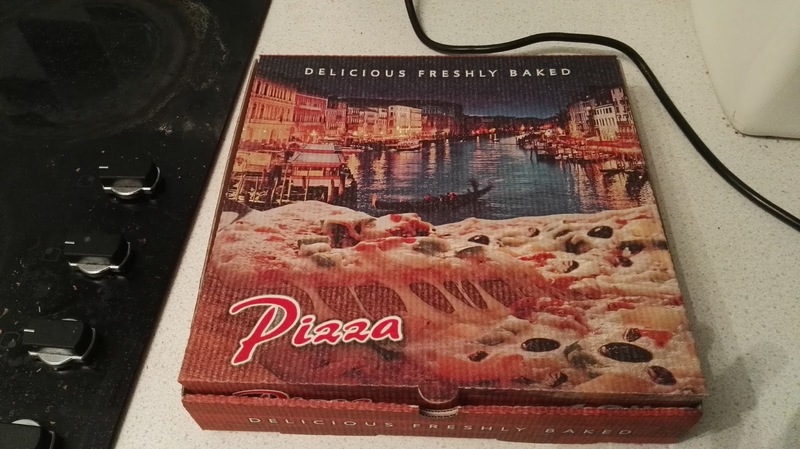 When ordering pizza I generally go for some sort of meat feast, although if I am going to Domino's it's more likely to be a Texas BBQ, and ideally I like a thin crust pizza, not deep pan. Sometimes I do try the "Chef's special" which is basically everything except anchovies, I don't really know what an anchovy is to be quite honest, I'm very inexperienced when it comes to fish - I like haddock, cod, and pollock when fried in batter and served with chips, I've discovered that I like tuna, perhaps with melted cheese in a sandwich or on pasta, or mixed with mayonnaise and on top of a jacket potato, but apart from these types I have very little experience of fish. Swordfish I tried once and it was very nice, but whenever I'm shopping, spot the fish counter, and think "hey, swordfish is okay" I then see the price and realise that actually I ought to work on clearing the mortgage rather than having to apply for a new credit card to pay for the swimming thing. I have had tuna on pizza, and it was actually okay, but it did still seem a bit strange to me, I felt uncomfortable eating it, in a similar way to how you might feel uncomfortable changing seats on the third or fourth day of a week-long training course - theoretically you can certainly do it, and there's nothing necessarily wrong in doing it, but you wouldn't. Social norms, and all that. What's your favourite pizza toppings? Diane Lynn of www.thegratitudeletters.com - The Gratitude Letters is a great blog which makes you stop and think for a moment about all those things in life that we should be grateful for. I find it very beneficial, I'm a nightmare for rushing from one thing to another without allowing enough time to contemplate. Do check out her blog. Denkai Designs - my wife kindly supported us, I presume so that we'd not run out of money and have to come home early! She's a flosstube YouTuber (she videos about cross stitch) so do check her stuff out, she's annoyingly good on camera. Also thanks to deano_1 and cinders1980 who also both kindly supported us! Sadly, the sponsor t-shirts that we were planning to wear I just can't make happen, I'd love for them to but it would just take too much out of the contributions to do. Nevertheless we'll be recording videos while we're away and I'll be blogging and videoing when we get back (internet access in Robin Hood's Bay isn't the best, plus I don't have a laptop to take anyway) which I hope will be good fun for everyone! The Robin Hood's Bay Roadtrip!